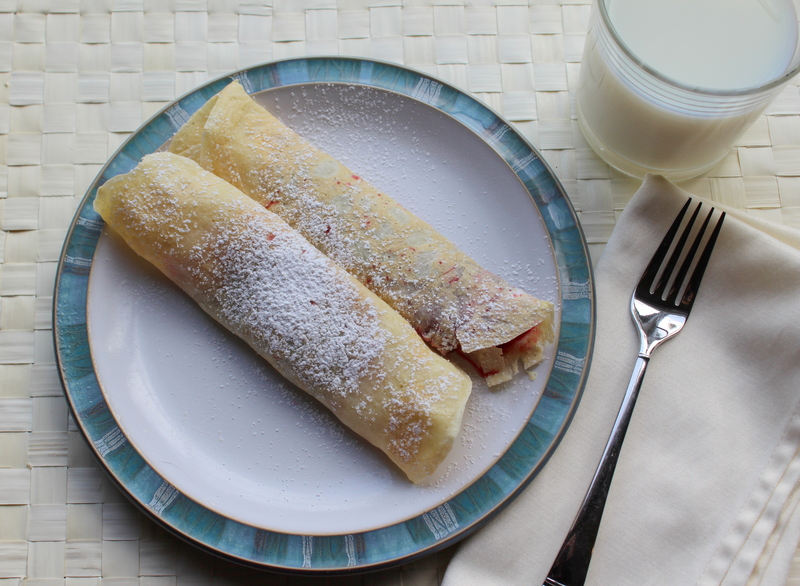 These aren’t actually pancakes, but crepes, but DO NOT let that word scare you. It did for me for many years, and I certainly missed out. You don’t need a crepe pan or any other fancy cooking device, just a small skillet and a spatula. A tip I learned about crepes: when pouring out a bit of the batter into the hot skillet, lift the pan off the burner and swirl it around a bit, evenly coating the pan, before placing back on the burner. Not only will it make the crepe thin, but you’ll look like a professional doing it, therefore impressing your family and friends. And when you flip it, if it folds in on itself, no need to panic. Just use your fingers to let out the crease. In a bowl, sift flour and powdered sugar. In a separate bowl, mix the eggs, milk, vanilla, and salt. Slowly add the melted butter. Using a whisk, add the flour and powdered sugar, and mix until smooth. Heat a small non-stick skillet on medium-low heat. Add one tablespoon butter to the skillet and melt. Add 4-5 tablespoons batter to the skillet, swirling the pan to evenly coat the bottom of the skillet. Cook for a few minutes, or until the batter browns around the edges. Flip the crepe and cook for another minute or so before placing on a plate. Continue with remaining batter. 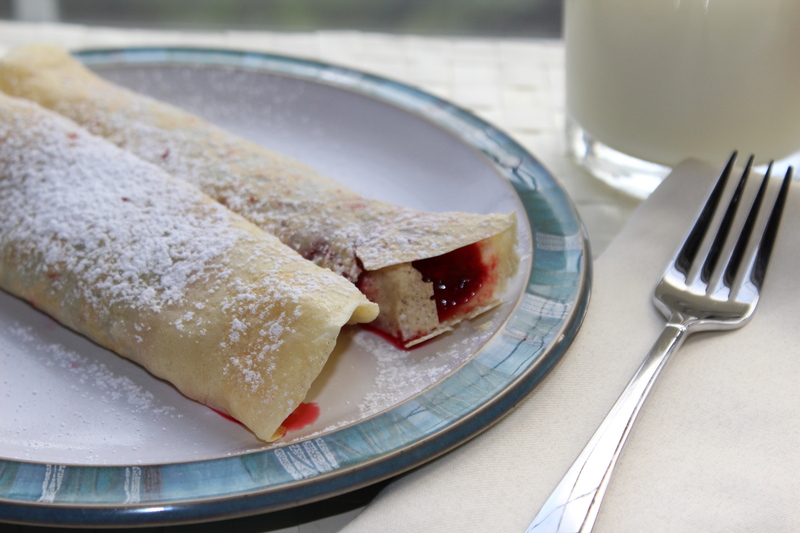 Spoon jelly down the middle of the crepe and roll up. Dust with powdered sugar before serving. 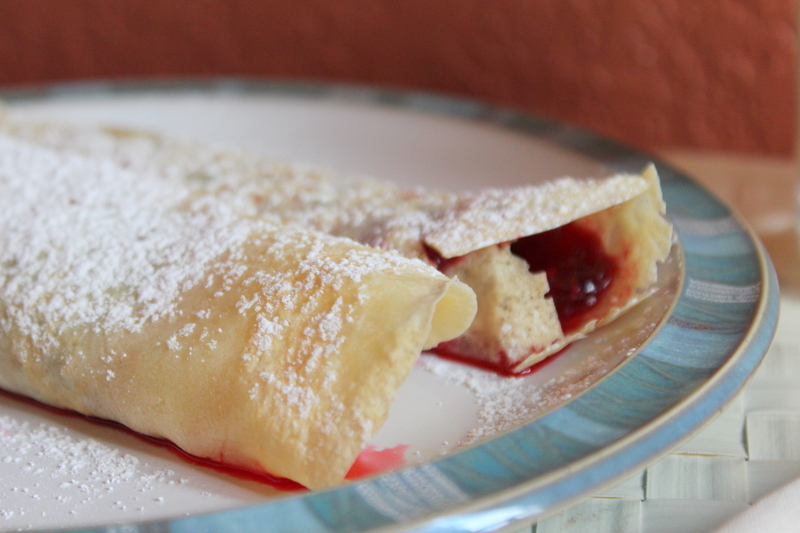 Omg, I love crepes, one of my favorites of all the time. HAPPY NEW YEAR!!! I love these with a very fine layer of brown sugar & a drizzle of lemon juice- so good! Oh, I’ll have to try that next time! We made these last week but with nutella, banana, raspberries and blueberries topped with powdered sugar and whipped cream! delicious!